The choice between playing with a pick or using your fingers has always caused debate among bassists. Although purists tend to prefer the warmer sound of soft fingertips over the harsher tone of pick on string, both techniques have their place for different reasons and often in different musical genres. Fingerstyle is arguably a more challenging technique however, especially if you come from a primarily guitar playing background. 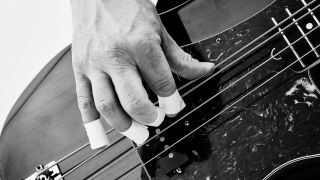 Here, we’re taking a brief look at four iconic rock bassists who prefer fingers over a pick, Steve Harris, Robert Trujillo, Flea and Christopher Wolstenholme. Keep in mind that you can extend their techniques to many parts of your playing, so this isn’t just a ‘soundalike’ exercise. Each of our examples will provide different challenges, but should ultimately make your picking hand much stronger and more rhythmically accurate. Although most people reference Steve Harris’s famed three-finger gallop, this example highlights his James Jamerson-like single-finger rake for picking adjacent strings. The open second-string drone provides a platform for the D minor notes (D E F G A Bb C) around it, so you could apply the scale all over the fretboard. The E Phrygian sound here should be familiar to any Metallica fan, but it’s the gallop at the end of bar 2 that’s the main technique to focus upon. By using your first, second and third picking fingers (marked ‘i, m, a’ under the tab) you can develop greater speed than a two-finger approach. Slow practice is essential. This Flea-inspired riff has a lot of heavy 16th-note swing, which provides a real challenge. Try to lock in closely with the drums and guitar and break the riff down into short phrases to master each element. Like Flea, you may want to try the last two chords as a thumb strum for more power. Much of the Muse sound comes from classical-inspired minor and harmonic minor harmony. Here the A Phrygian dominant scale (A Bb C# D E F G) is used with open string pull-offs and slides to facilitate faster moves around the fretboard. In this way the fingerstyle hand is a lot more efficient, relying on the fret hand for speed.